Shares of NVIDIA (NASDAQ:NVDA) plunged 25% in October, according to data provided by S&P Global Market Intelligence. For context, the S&P 500 lost 6.91% of its value. 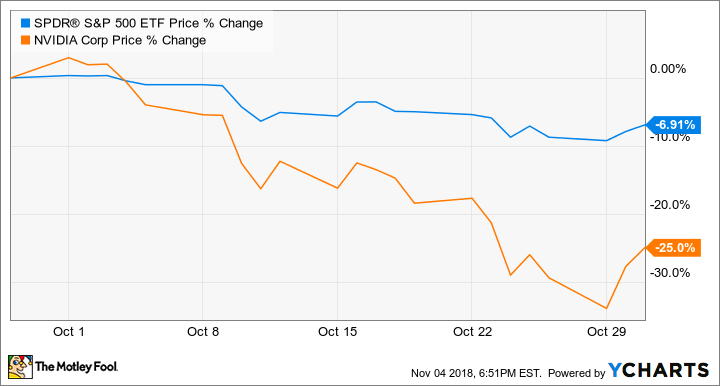 Through the first nine months of the year, shares of the graphics chip maker were up 45%, but the stock took a sudden nosedive after the start of October. To be clear, there was no news from NVIDIA to cause the decline in the stock. The loss seems to coincide with the broader market sell-off over the last month, as well as weak guidance issued by major chip companies, which caused investors to take a bearish stance against the semiconductor industry. Over the last month, chip stocks have underperformed the broader market as concerns about slowing demand for processors across the industry have been raised by some analysts. Those worries seemed to have been validated when Texas Instruments, Cypress Semiconductor, and NVIDIA archrival Advanced Micro Devices (NASDAQ:AMD) reported their quarterly results last month. NVIDIA's share price plunged about 15% in the days following AMD's third-quarter earnings report. AMD reported revenue growth of 4% year over year, which was below management's guidance for 7% growth. Given that AMD and NVIDIA compete in the same markets of gaming, data center, and professional graphics, investors look to AMD as an early indicator of what to expect from NVIDIA. NVIDIA's stock price has rebounded over the last week following a strong earnings report from Intel, which has eased fears of a potential slowdown across the industry. Additionally, an analyst with JPMorgan Chase upgraded NVIDIA stock at the end of the month, citing the graphics specialist's long-term growth prospects across gaming, data center, and self-driving cars. But given the recent mix of results among chip stocks and AMD's weak graphics card sales, investors may want to brace themselves for more volatility in the next month, as NVIDIA is scheduled to report its third-quarter earnings Thursday, Nov. 15, after market close.